The mission of the California Association of Voting Officials is to develop and make available open voting systems for use in public elections, as well as to provide training, education and management practices to election officials for the effective employment of technologies. The web server with the IP-address 192.186.207.201 used by Cavo-us.org is owned by GoDaddy.com, LLC and is located in Scottsdale, USA. This web server runs a few other websites, mostly in the english language. 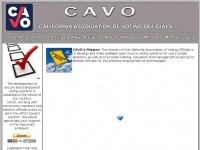 The websites of Cavo-us.org are served by a Apache server. The website does not specify details about the inclusion of its content in search engines. For this reason the content will be included by search engines.